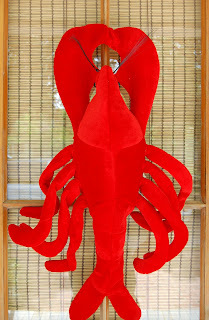 Finding door decorations or wreaths for a Crawfish boil or Cajun parties can be difficult. With a little creativity, crawfish themed products can be used in new ways to decorate the door for a Crawfish themed event. The jumbo felt crawfish hat is large plush crawfish hat that has an opening on the bottom so you can wear it on your head as shown. It is a big crawfish! This plush crawfish is too cute to just wear as a hat. It also makes a great door decoration or centerpiece on a table for a crawfish boil. The head opening of the crawfish body will need to be stuffed with a filler. Newspaper, plastic grocery bags or tissue all work well. The large front claws and tail can also be stuffed to add more dimension and stability to the body of the crawfish. To do this make small slits in the lining of the hat and fill each body part with additional stuffing. Then fill the body of the crawfish (the head opening) with filler, too. Stuffed this way, this crawfish could be used as the centerpiece on a table. This jumbo crawfish on the table would make an impressive centerpiece. He measures 30" long and over 20" wide. To use this crawfish for a door decoration, use a large safety pin to clip the two large front claws together. Thread the pin in and out of the fabric to get a good hold. Hide the pin on the back side of the fabric so it will not show when hung on the door. 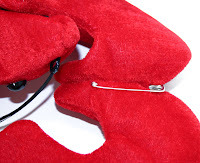 This safety pin becomes your hook to hang the crawfish from the door. What a warm welcome for your crawfish boil guests! Being greeted at the door by a smiling crawfish is sure to bring a smile to their faces.